It’s a common problem for apartment dwellers: You want to convey your holiday cheer in a big way, but you have barely any space in which to do so. The solution? Get creative with elements that make a big impact. 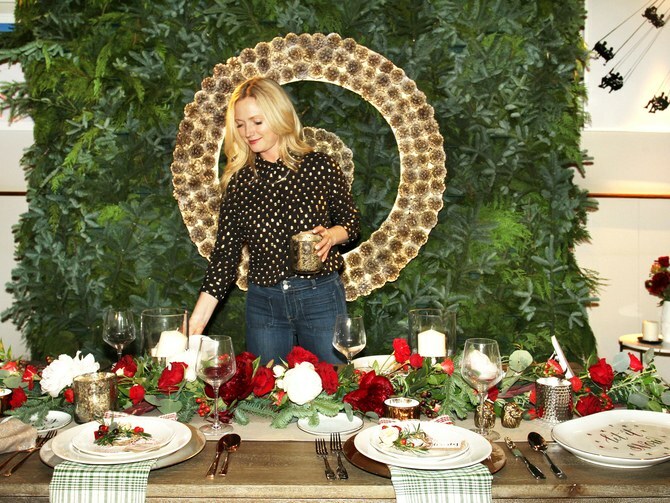 When designer and stylist extraordinaire Emily Henderson hosted a festive gathering at the Smyth hotel in New York last week, the Target home style expert revealed a few tricks for making a room of any size feel celebratory. How did she do it? Not with voluminous swags and over-the-top gestures, but rather with thoughtful updates on traditional holiday decor. Here, she shares her simple tips for maximizing space without feeling like a Grinch. Curate a palette. “Pick three to four colors you want to feature and stick with them,” says Henderson. “For the holidays, try a nontraditional yet festive palette, like cream or white, deep green, silver, and gold.” The cohesiveness helps to make a small space feel larger. Ditch traditional centerpieces. If you’re planning on hosting a party this season, start with a strong foundation of greenery. For her fête, Henderson invited Christy Doramus of Crowns by Christy to make a garland centerpiece dotted with red, blush, and white roses and peonies for the table, which added a burst of December color. Not only are they merry and bright, they are also practical, allowing people to converse without craning their necks or visually blocking off parts of a room. Choose footed bowls. Doramus suggests incorporating serveware with a foundation (think trifle bowls or cake stands) to free up space on the table for decorative items such as votives and additional glassware. These types of dishes will also help achieve a varied sense of height, which draws the eye down the length of a table and is one of Henderson’s go-to tips.